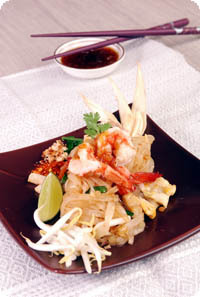 Medium size rice noodles* 7 cup. Golden Mountain sauce 1 tbsp. Coconut sugar 1 1/2 tbsp. Sweet soy sauce 2 tbsp. Ground Hot chilli 1/2 tbsp. Water or chicken stock 1 cup. Yellow bean curd, finedly dice 3 tbsp. Ground roasted peanut 3 tbsp. Shrimp, shell out 10 pcs. Lime cut in wedges 1 pc. In the bowl put fish sauce, golden mountain sauce, tamarind juice, coconut sugar, sweet soy sauce, ground hot chilli, water or stock, and sriracha sauce. Mix well. Heat oil in a frying pan. When hot, add eggs, stir for 1min., add yellow bean curd, sweet turnip, and shrimp. Stir fry for 2min. 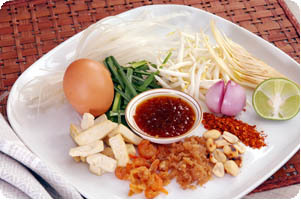 Serve with additional bean sprouts, scallions, lime wedges, ground chilli and banana blossom on the side. if you like more sweet you can add sugar when you eat and if you eat with some one that don't like spicy, you can put sriracha sauce on the side and not cook with it. High calories, protein, fibers, calcium and phosphorus.